Julie's Boyz: "You mean that happy child?" "You mean that happy child?" Anyone who has watch the original Toy Story movie more than once (as most parents can claim) will get the title reference, but in case you live in a bubble, have girls or have just gone several years without seeing the fabulous, first Disney-Pixar collaboration, I will explain. 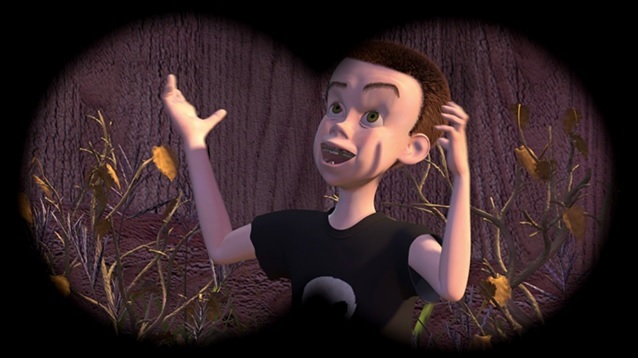 There is a scene where Sid, the horrible middle school boy next door, is plotting to blow up one of his toys and he is laughing maniacally at the destruction he is about to inflict. The toys are trying to explain to newcomer Buzz Lightyear that Sid is basically the scourge of the neighborhood and Buzz sees him laughing through binoculars and asks, "You mean that happy child?" Alan has the world's cutest giggle and frequently laughs to himself for no apparent reason. That said, some times it takes on a bit of a maniacal quality that makes DH or I turn to the other and say, "You mean that happy child?" I don't know if it is the fact that we recently put up the Christmas tree and Alan is excited about the holidays or if he is just outgrowing his meds or if it is because it has been too cold lately for him to go outside without shoes, but Alan has been incredibly moody lately. One minute he is laughing maniacally and the next he is screaming and hitting and trying to climb on the fireplace mantle. This past weekend I captured this period of giggles and an hour later he was in time out. Sigh. This kid will be the death of me! I think it is time for me to go play with my minis. Oh Julie I did get the reference but Alan is so not Sid. Okay he might torture you....but I'm thinking tell the relatives you need an indoor jungle gym put on your house or a gift card to an indoor rock climbing wall. and then escape to your happy place! It is amazing the highs and lows one chlld can go thru in one day! Well...sometimes even in a few moments. May this season be merry and bright for all of you. Indoor climbing gym...now that would be great for him! Hey, we need OUR special interests!! !